If you happen to be searching for a different sort of online/multiplayer game, then look no further! The Ship has finally docked after its inaugural voyage, and is ready to be boarded by PC gamers everywhere. As a passenger on a free cruise, you'll have to outwit your fellow shipmates and either hunt them down or be hunted yourself in order to win this devilishly fun and addictive game. Just remember to pack your bags lightly, because the odds are you won't live long enough on The Ship to even unpack. It takes a truly innovative title to make this PC gamer go 'Wow', simply for the fact that after all of these years of video gaming I've pretty much seen it all. Or, at least in my pathetic little mind, I thought that I had. So, when I was first began reading posts on various gaming community boards about the independently produced PC title known as The Ship I didn't really pay too close attention. As the months rolled on down the paths of time, I started to notice more posts concerning this eclectic game, and I started to get the itch in the back of my skull that marks the inquisitive aspect of my personality. While re-installing a copy of Valve's software downloading program Steam in order to get the latest Half-Life 2 Episode, I ran across The Ship unexpectedly in the downloads section. For a mere $19.99 the game was offered up to me as bait…and I took it, hook, line, and sinker. To say that I was unexpectedly pleased with the game is just a mere understatement. In fact, The Ship is one of the best PC games I've had the opportunity to play this year. The premise behind the game is a rather simple one, to be completely honest. Then again, some of my most favorite games are simplistic in nature (can you say PONG boys and girls?). Players are invited to a free luxury cruise by the mysterious benefactor known only as 'Mr. X'. Once aboard, players are forced to join in a sick and deadly game of cat-and-mouse with their fellow shipmates. 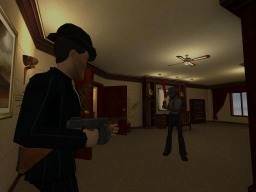 Each player is given a target to assassinate, but are also themselves targeted for assassination. 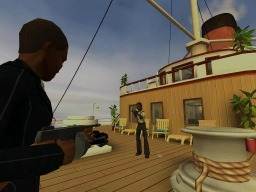 With only a name and a gender, players must search the ship for not only their intended victim, but also for a weapon to kill them with. To keep things even more interesting, players must also juggle their standard bodily functions and needs, including eating, drinking, sleeping, mood, cleanliness, defecation and urination. So, not only do players have to worry about things like taking a shower and eating, they also have to check out each and every other player up close and personally in order to find out whom their intended target is. To add salt to the wound, players cannot simply run up and attack their targets brazenly. If you decide to brandish a weapon in public and are seen by more than just your intended victim, you'll be arrested, thrown in jail, and fined a hefty amount of money (did I mention the Policemen and securities cameras stationed throughout the ship?). As money is the key to actually winning the round in The Ship, losing any bit of cash during the course of a game can be a very painful situation. The whole of this title screams of a very creative design team. Not only is the premise behind the game inventive, the surrounding features of The Ship also have a genuinely fresh and original feel to them. The 'Art Deco' designs behind the graphics and characters are the major stand out features, giving the visuals a real stand-out quality. That coupled with the retro sounds of early 1930's vaudeville styled music played throughout the ship, you get a very retro vibe to the in-game play. Even the myriad of items and weapons found in the game that can be used as tools of assassination have a very interesting aspect about. While the usual bits of first-person shooter inspired items of mass destruction can be found (revolver, Tommy Guns, knives, etc.) The Ship goes out of its' way to deliver even more ingenious bits of carnage to the player. While the list is a tad bit long (as are the ways you can kills someone) my personal favorites included the manikin arm, the flare-gun, and the always lethal exploding purse. To wrap things up, I have to once again eschew how much I enjoyed playing The Ship. It is one of the most fun and original FPS titles to come out in years, and I've clocked more than my fair share of hours on this online game since I found the hard drive space on my computer. The only real downfall I came across were the lack of servers on the internet for the game. However, as the word has gotten out just over the past few months, more and more dedicated game sites have popped up, providing more places to play the game against real people online. So, if you happen to be a fan of FPS gaming, but are not afraid of trying something just a tad bit different, do yourself a big favor and download The Ship. You won't be disappointed.